Halogen MR16 Light Bulbs. Crisp white halogen light provides dramatic accents and highlights. Colors appear rich, vibrant and natural. 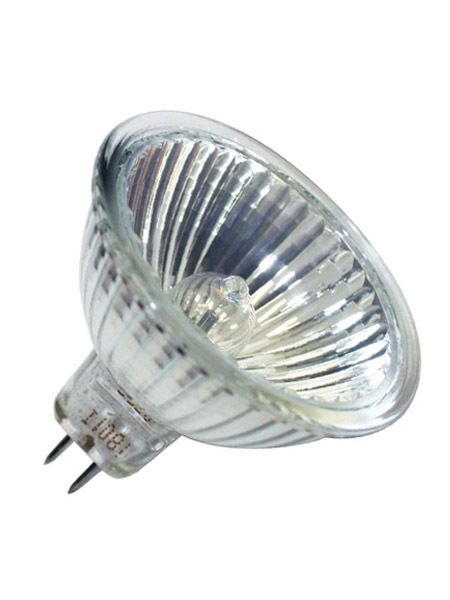 Bulb and reflector are protected from dust and dirt which can substantially reduce light output. GE ConstantColor ® Precise™ IR Energy Saving MR16. GE has combined the industry proven, high quality of light, ConstantColor ® Technology and its energy saving Precise™ IR technology to produce the new Halogen ConstantColor ® Precise™ IR line of MR16’s … the only choice for energy saving, consistent high quality Halogen MR16’s. Energy Savings Huge Cost of Light Savings on these lamps. These lamps are up to 30% more efficient than standard MR16 lamps. Halogen IR Technology GE invented IR technology in 1990 and the new ConstantColor ® IR MR16 product is the newest edition to the product family. Most of the wattage used by standard lamps generates invisible infrared light energy. The Precise™ IR halogen capsule has a special infrared coating which redirects this wasted electricity back onto the lamp filament. Using this recycled heat allows the lamp to consume less energy. Crisp, white light GE IR lamps offer great color at 100 CRI & 2950K; The hard coated dichroic reflector with an axial filament produces a very smooth beam pattern. Long lamp life 5000 hour life and less than 1% of light “leaks” out the back of the lamp. Sometimes less than 1 year payback. Direct replacement for existing MR16 lamps Both the IR and ConstantColor ® IR lamps operate on the same transformer required for any MR16 lamp. Just install and enjoy the beautiful light and save energy! UV Control The IR coated capsule and the cover glass combine to virtually eliminate UV-B and UV-C radiation. GE’s Precise™ IR is ideal for heat sensitive applications and also reduces fading and discoloration. GE ConstantColor® PRECISE™ MR 16 Lamps. The only choice for Consistent High Quality Light and Long Life. Consistent High Quality Lighting Lamp-to-Lamp over Life, plus UV Control. Now with up to 6,000 Hour Life. GE’s exclusive ConstantColor reflector coating assures consistent white light with no color shift ever, throughout the life of the lamp. And GE 50-Watt ConstantColor PRECISE lamps now have an extra long 6000 hour life. In MR16 lighting, there’s only one choice to show your merchandise, furnishing and décor in the best light… GE ConstantColor PRECISE. CONSISTENT WHITE LIGHT OVER LIFE Only GE ConstantColor PRECISE MR16 lamps, with the exclusive ConstantColor reflector coating, delivers consistent white light over their rated life. Crisp white halogen light provides dramatic accents and highlights. Colors appear rich, vibrant and natural. Ordinary MR16 lamps can produce a murky, green light as they age, discoloring lighted objects. MORE LIGHT OVER LIFE GE’s exclusive ConstantColor coating means no light loss due to coating degradation. The result is over 90% maintained light output over life. The GE ConstantColor coating withstands the test of time. LONGEST LIFE ConstantColor PRECISE lamps last up to 6000 hours….that’s 2000 hours longer than most MR16s. UV CONTROL ConstantColor PRECISE lamps are designed to control UV without reducing light. UV Control means less fading and discoloration of objects being lighted. CONSTANTCOLOR PRECISE COVER GLASS LAMPS The advantages of ConstantColor PRECISE plus a glass lens to maintain efficiency. BULB/REFLECTOR PROTECTED DURING REPLACEMENT Cover glass eliminates fingerprints on bulb and reflector areas which can reduce light output. Also reduced possibility of damage to the reflector from careless handling. A CLEANER BULB FOR MORE LIGHT Bulb and reflector are protected from dust and dirt which can substantially reduce light output. Clear glass lens retains the optical advantages that made GE PRECISE lamps the industry standard.